Cyrano de Bergerac by romantic French playwright, Edmond Rostand, recounts the fictionalized story of the historical long-nosed cadet and his unrequited romance with his cousin, Roxanne. Titan Theatre's Cyrano, adapted down to a tight 75 minutes by Jo Roets, thrills with a cast of four, smart direction, and a heartfelt performance by their leading man. It's always a pleasure to see a piece of theatre where every element has been considered, and where every artist is working towards the same goal. That was Titan Theatre's Cyrano. From the very beginning, the audience is made aware of the inherent theatricality of this production. From a faux-proscenium curtain, to the visible costumes waiting on coatracks in the "wings," a piano center stage, and the whole cast calling out: "Act One!" we're put into a hypertheatrical world. A world where two men can convincingly woo as one person in the dead of night, a world where a long-nosed cadet can compose poetry while fighting a duel. Mary MacDonald-Kerr's direction is tight, smart, and fluid. She works with her cast of four to keep the action moving, making the transitions between scenes almost cinematic with stage compositions - such as the montage at the top of Act Four where Cyrano writes Roxanne letter after letter after letter. Her work is aided by the beautiful score by Jessica McIlquham, and by Lenny Banovez' and Emily Clarkson's agile scenic and light design respectively. Anthoy Paul-Cavaretta's costume design is truly impressive, allowing the actors to duck in and out of various characters throughout the play, while still maintaining the complicated silhouettes of 17th Century France. Special commendation should be given to Molly Thomas' fight design. Not only did she absolutely nail the spectacle of the first rapier poetry duel, she also created a hundred-to-one man battle with only four actors, as well as a comical duel between Cyrano and De Guiche that involved a hatstand and a considerable amount of commedia. All four actors shone, each well suited to playing multiple characters in farce convincingly. Greg Brostrom was suitably menacing as De Guiche, while Madison Hart proved a lively Roxanne. Andrew Garrett played the beautiful Christian broadly as a true bro in a blonde wig, a puppy dog of a romancer: earnest but ultimately unequipped to win such a vivacious woman. Undeniably, though, this show belonged to Tyler Moss as Cyrano - the second time he's returned to the character, and may he inhabit the cadet many more times to come. Moss, who is well-versed in commedia and classics, as anyone who saw his turn as the Clown in Shakespeare Forum's recent Lear can attest, blends farce with feeling as the long-nosed lover. Where so many actors, though, expend energy on Cyrano's bravado or his lovelornity, Moss' dexterous interpretation allows for the painful humanity of the character to shine through. This is a Cyrano who delights in showing off on the field of battle or in a match of wits, a Cyrano who's always one insult away from a punchline or a punch, but also a Cyrano full of hope and yearning and the desire to do right by others. Most painfully, Moss tapped into Cyrano's Achilles' Heel: that is not so much Cyrano's nose, as it is Cyrano's view of his own worth as a result of his nose. What seems as plain as the nose on his face to him - that is, Cyrano's belief in his own ugliness - is barely a matter of concern for anyone on that stage but himself, making Cyrano's inability to see himself as he is all the more painful. Male self-image is rarely explored, and Moss allowed this Cyrano to rock between being puffed up on his own hope: a hope that could be extinguished with the single word of "beauty." With such a short running time, those who love the original play may be disappointed at some of the cutting, including Cyrano's final speech about his panache. And given this adaptation's interesting history - it was first translated into Dutch, and then further translated into English - the rhyming couplets which are preserved only at the top of the play are a bit strained. One may wish, too, for the same groundedness and ability to clown among all the actors (who otherwise tended to choose one or the other at any given moment), but these are small quibbles, and only in service of how to make this extraordinary production even more cohesion. 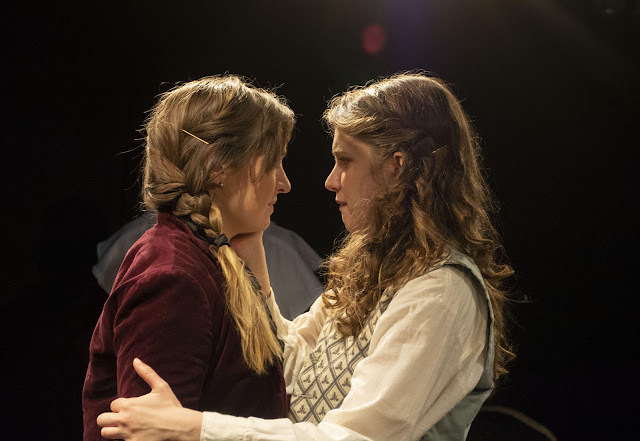 Titan Theatre will be returning next with Hamlet - another play that is well-served by an excellent artistic team and actors capable of treading the line between comedy and tragedy - and if Cyrano is any indication, theatre-goers are in for a treat. As for that swashbuckling Cyrano, I can only say that I laughed as uncontrollably as, at his final bittersweet moments, I wept. And from this reviewer, at least, who rarely stands during the final ovation, I was the first on my feet. A brilliant production. 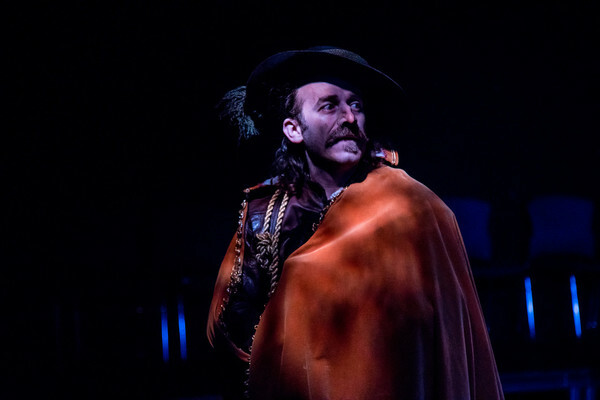 Titan Theatre Company's Cyrano played through February 17, 2019.